This important book examines the potential for a new community led service model in public libraries. Using theoretical approaches to working with socially excluded community members, with a direct application of those approaches in Canadian public libraries, the authors offer a powerful and persuasive case for adopting the community led approach in libraries worldwide. The book showcases good practice and outlines the challenges to community development work. With public libraries facing budget cuts, this book offers an alternative way forward based on a community led approach to developing needs based library services. This book makes a unique contribution to public library thinking and policy, synthesising the outcomes of research and best practice at the cutting edge of library service delivery, and will be essential reading for all those researching and working in the public library sector. 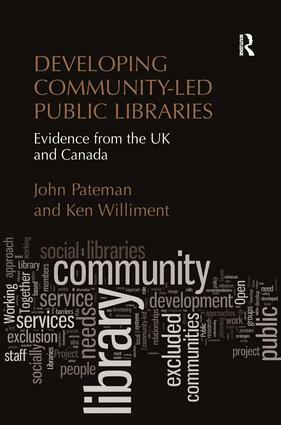 John Pateman has worked in UK public libraries for over 30 years at all levels, including Head of Service in three local authorities. He was a member of the research team which produced the ground breaking Open to All? The Public Library and Social Exclusion. John has written a wide range of articles and books on public libraries and social class, social exclusion and internationalism. He was awarded La Distincion Por La Cultura Nacional by the Cuban government in recognition of his support for Cuban libraries. John was the co-founder of Information for Social Change and he has worked closely with members of the Working Together Project in Canada. He is currently Chief Executive Officer for Thunder Bay Public Library Service in Ontario, Canada. Ken Williment has recently become a branch manager at Halifax Public Libraries. Prior to this, he worked as a Community Development Manager at Halifax Public Libraries, during and post Working Together. In this role, he worked closely with branch and service managers to integrate community-led approaches within library staff work. Ken writes on community-led approaches on the Social Justice Librarian blog and published the award winning article It takes a community to create a library� which has been republished in a number of journals including Partnership Journal (Canada), Public Libraries (US), Bis (Sweden), and Information for Social Change (UK). He has also published articles on integrating community led work into branches in Public Libraries, and Asset Mapping in Partnership Journal.